Featuring the best of border cinema, the Trans-Border Institute’s annual Border Film Week will showcase documentary and fiction films offering attendees a broad vision of border culture. Oliver Rendón, Director / 32 min. Jacaranda Correa, Director / 90 min. Adriana Trujillo, Director / 10 mins. Gabriela Martínez, Director / 54 min. • Dr. Julia Medina, Department of Languages and Literatures, College of Arts and Sciences, USD. • Dr. Douglas Carranza, Program Director of Central American Studies Program, California State University Northridge. • Dr. Antonieta Mercado, Communication Studies Department, College of Arts and Sciences, USD. • Dr. Kevin Guerrieri, Department of Languages and Literatures, College of Arts and Sciences, USD. 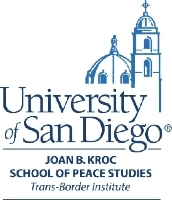 Co-sponsored by the University of San Diego Enhanced Student-Faculty Information Fund, the Department of Languages and Literatures, the International Studies Center and the Latin American Studies Program. Ana Andrade, Bryan Chillian, Jesus Guerra, Directors / 7:51 min. Mark Kendall, Director / 72 min. Adrián Arce and Antonio Zirión, Directors / 36 min. Luna Marán, Director / 23 min. Pavel Valenzuela, Director and Dr. Manuel Valenzuela, Producer / 63 min. • Dr. Manuel Valenzuela, Director, Producer and Professor, Department of Cultural Studies, Colegio de la Frontera Norte. • Dr. Alberto López Pulido, Professor and Chair of the Department of Ethnic Studies, College of Arts and Sciences, University of San Diego. Fiamma Montezemolo, Director / 20 mins. • Dr.Olivia Ruiz, Department of Cultural Studies, El Colegio de la Frontera Norte and University of San Diego’s Lecturer. Border Film Week is produced in partnership with POLEN and Non.Format. These are all free movies. We enjoyed what we saw last year, and the panels were enlightening. Last year’s programs were very good, and they are all free. Well worth your time. Next PostMar 23 – Monthly Meeting – Barrio Logan: Community or Industry, Who Decides In Our Democracy?